Exclusive luxury jet charter service with Aloha. The Resort Group, a name that offers you world class resorts throughout the islands of Hawaii, is pleased to offer Hawaii's only locally owned and operated jet charter service, Resort Air. Hawaii owned and operated since 2006, Resort Air understands how important your time is whether your trip is for business or leisure. We offer private jet travel with full service, safety, security, luxury and convenience, with as little as four hours notice, and access almost anywhere in Hawaii. Our aircraft is piloted and maintained by some of Hawaii’s most experienced and knowledgeable professionals. Our safety record is second to none, and our dedication to service is evident from the moment you step aboard. 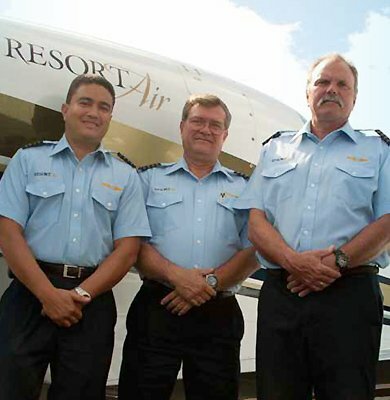 All Resort Air pilots attend a mandatory recurrent training course yearly from Flight Safety International. This ensures maximum safety and professionalism in everything we do. Resort Air is a member of the National Business Aviation Association and NATA which promotes aviation safety, access, professional development, operation excellence and security in the aviation industry. Contact us today for private jet charter prices. © 2008-2019 Resort Air. All Rights Reserved.